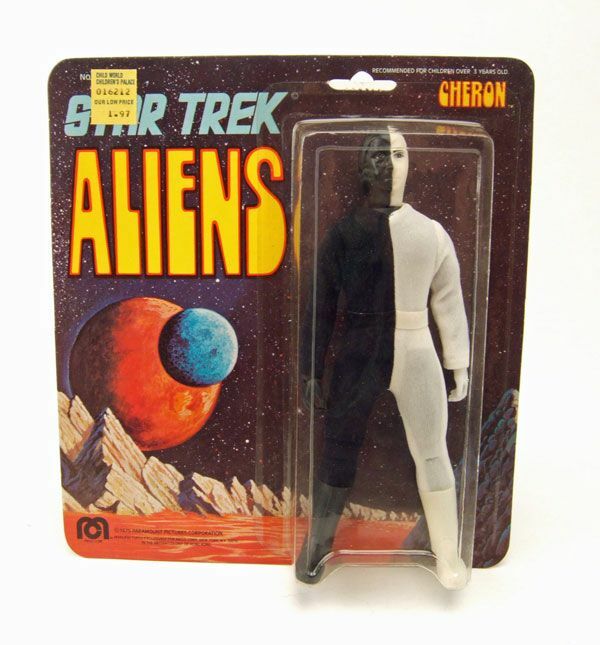 Mego released this Cheron as part of it's first assortment of Star Trek Aliens 8" figures. 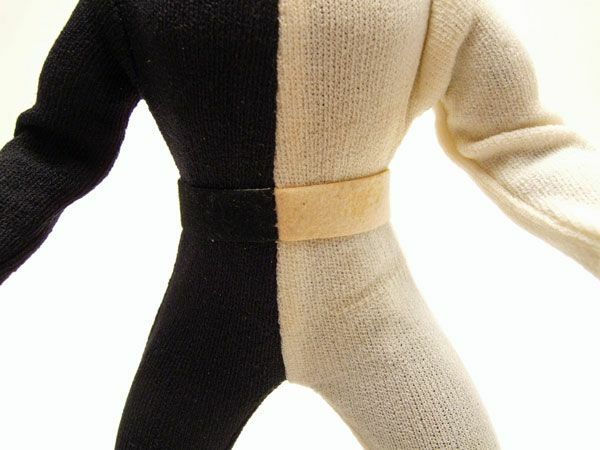 Instead of just doing the split face with a solid colored outfit like the show, Mego expanded the gimmick to cover the whole outfit. It may be inaccurate, but it actually kinda works in the "toy world". 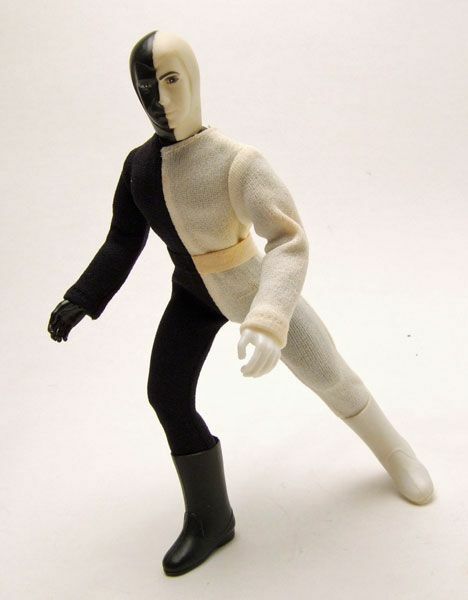 The figure is definitely catches your eye much more than if he'd been clad in just a solid gray jumpsuit. The head is where I have the most issues. First, it's a retool of the Planet Of The Apes Virdon. That's not too big of an issue, since the color scheme makes him pretty unrecognizable anyway. It's the retooling that I have issue with. 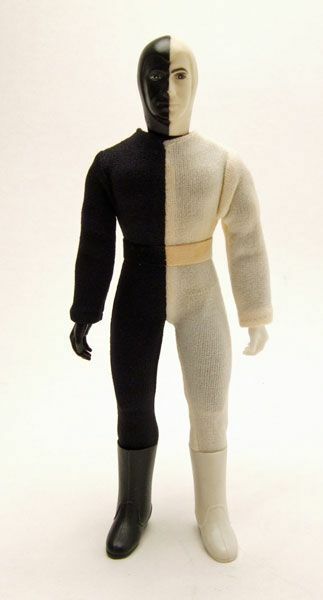 For some reason, Mego changed the head to add a hood all over it. Not really sure why they did that, since the Cheron's have their hair exposed in the episode. It would have made more sense to just use the Virdon head as is. Ah well, guess it saved them the paint app on the hair. If you're going after a vintage Cheron, one thing to watch out for is outfit discoloration. 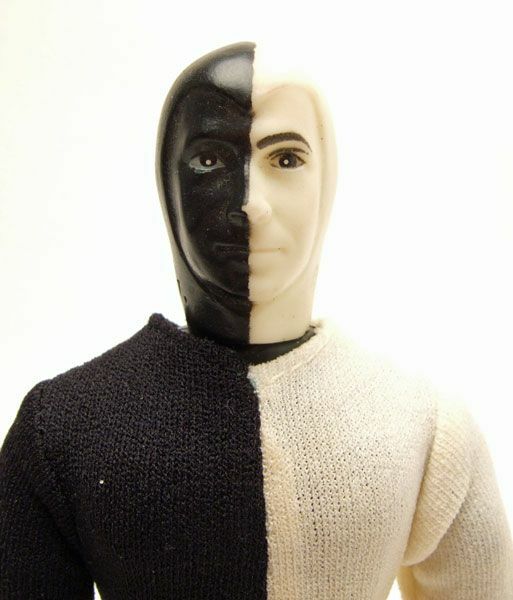 The Cheron body is cast in black plastic, and over time the black dye reacts with the white of the outfit and causes staining. Bummer. There's always the DST reissue! This one stacks up pretty well against the original. 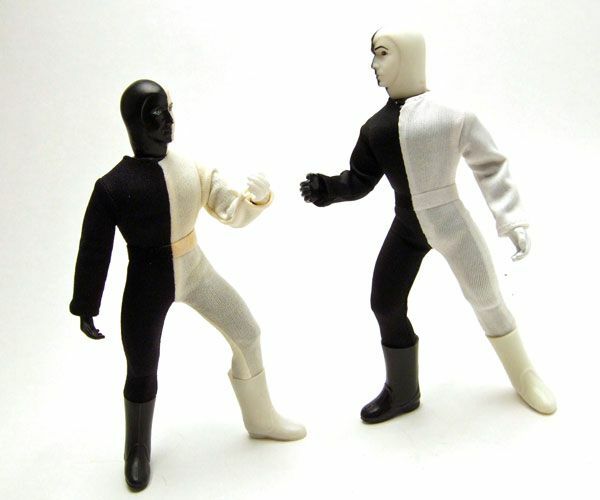 The outfit is obviously much brighter and cleaner, the boots have a bit more gloss, and the left white hand is painted white instead of being molded in white plastic. It's a pretty close approximation, and a more affordable alternative if you just want a Cheron. 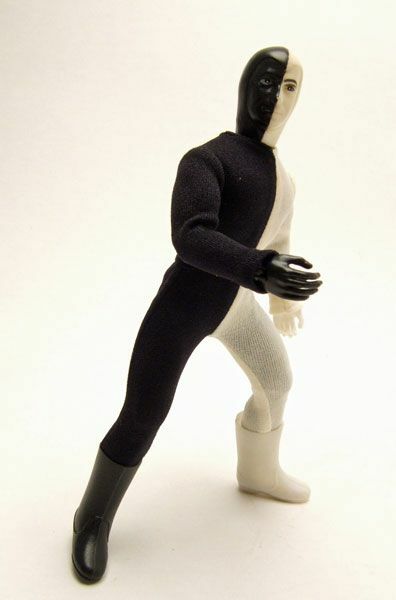 So there ya go Gorshin fans...the Cheron! Get one...get 'em both! 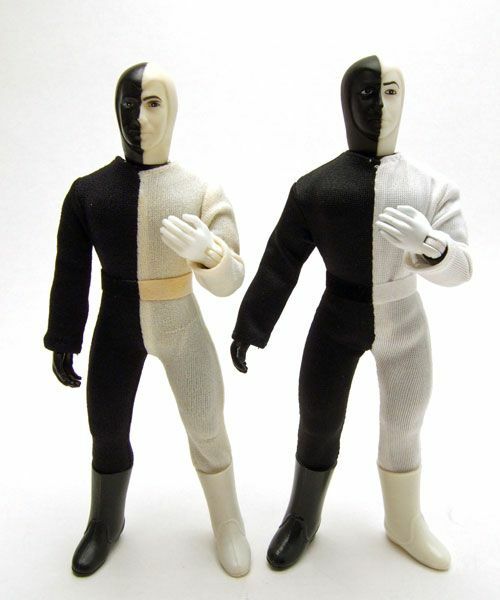 The Cheron is one of Mego's better alien efforts and is definitely worth a look. 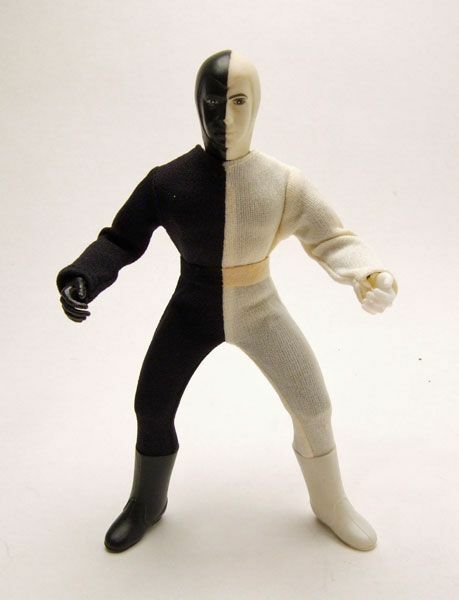 Labels: AA/ DST, Cheron, DST/ EMCE (Mego Style), Mego, Mego 8"
Almost all Mego Colelctors that I have spoken with don't really hold the staining against the figure. Still if you can find one, all the better.